The race to publish books milking Apple co-founder Steve Jobs's leadership traits and offering them as lessons for managers has not ended even a year after his death. 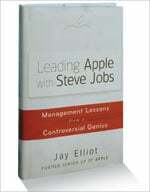 The author of this book, Jay Elliot, a former Senior Vice President of Apple, is fully aware of the overkill. He himself has already done a book on his former boss called The Steve Jobs Way. He thus takes pains at the outset to explain the need for this one. "Isaacson's Steve is not the Steve I knew," he says in his preface, referring to the bestselling Steve Jobs: A Biography by Walter Isaacson. He adds that the book was "unfairly negative and critical of him (Jobs)". Jobs believed the best hiring results came when one was picky, choosing employees as carefully as one would a girlfriend or boyfriend, a husband or a wife. One settles down, hoping for a gripping inside account of how Jobs ran Apple and made it the most valuable company in the world. But what one gets is more of Jobs's approach to human resources, and less of other aspects of management. Not surprising, considering Elliot's primary responsibility was HR. Still, the book has many interesting snapshots. It reveals a lot, for instance, about Jobs's passion for selecting the right people. Best hiring results, according to Jobs, come when one is picky, choosing employees as carefully as one does a girlfriend or a boyfriend, a husband or a wife. You need to light each others' fires. Jobs, Elliot tells us, participated in hiring more than 5,000 people. And how did Jobs interview candidates? He was never interested in resumes. He never trusted professional recruiters. Instead he looked at the kind of talent the person being interviewed could bring to the company. His interviews were more of conversations. The value he attached to people is best summed by a quote Elliot reproduces: "When you're in a start-up stage, the first 10 people (you hire) will determine whether the company succeeds or not." To foster innovation, Jobs preferred a pirate-like organisation to a bureaucratic one. This, says Elliot, was critical to Macintosh's initial success in the 1980s. We also learn how good Jobs was at saying no. Even when it had become a $30-billion organisation Apple had just 30 products. Jobs agreed to develop those 30 after saying no to hundreds of others. We also get insider knowledge on Jobs's use of language. In his vocabulary, "bozo" was a person who was not doing things as fast as he wanted. "That's s---" meant he was not happy with the user interface of a product the engineer had shown him. The comment every employee of Apple loved to hear was "insanely great". It was his highest praise. The book does not follow chronology. So reading from cover to cover may not be a good idea. There are repetitions galore. It is better to read the chapters in a random manner.